It's finally arrived!!!! Yesterday, I departed the UK ( just as the weather is predicted to improve - typical!) for the sunny climes of the Czech Republic. My destination? The capital city, Prague. The event? The 2015 Annual Meeting of the Society for Experimental Biology (SEB). My task? To spot the gems amongst the research being presented to write up as feature articles for future SEB publications. 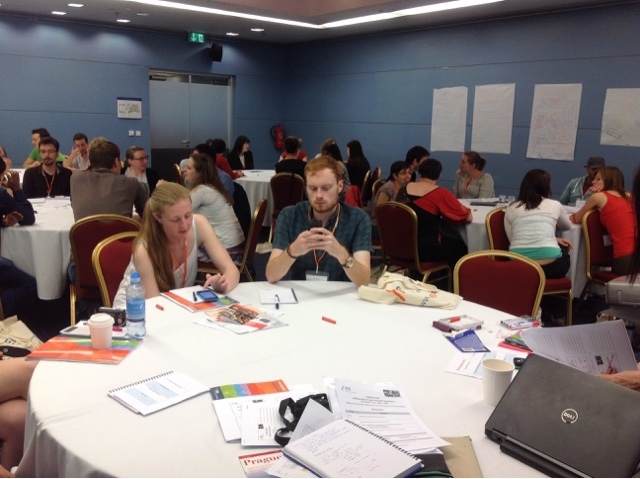 With multiple sessions running concurrently and the topics ranging from climate change, epigenetics,food security and new ways to teach science degrees to undergraduates, this was a daunting task! Even if I had been given another whole month to simply prepare for this conference ( rather than trying to juggle it with my own research!) I still don't think I would have felt ready. 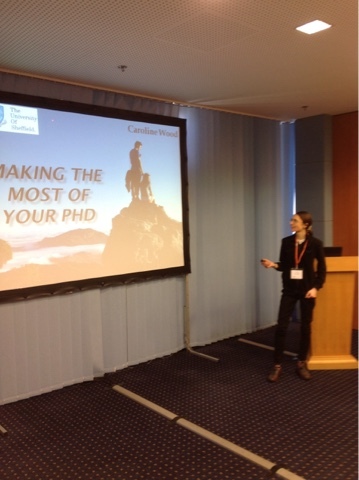 But my work was to begin even before the conference proper got under way...somehow I had agreed to help Sarah Blackford ( my 'boss' at the SEB who invited me here to act as official science writer) deliver a career session for phD students...which included giving a talk entitled 'Making the most of your PhD'. First job, collect my registration pack and finally get my hands on a hard copy of the programme - it seems a shame to deface its pristine pages with my notes of the sessions I don't want to miss. Then I meet Sarah and we scout out the room for our session, making sure the setup is 'interaction friendly' - circular tables to stimulate discussion - and that our laptops are talking to the projector screen. The minute the delegates arrive through the door, we put them to work on my idea for an 'icebreaker exercise'. Each person is given a grid of squares with different headings such as 'find someone who has a business card' and 'find someone who can speak more than one language'. Their task is to introduce themselves to each other and put a different name in every box! It works even better than I could have hoped and the delegates are soon on their feet and mingling together. It certainly is a good strategy to avoid the usual silence and awkwardness when you suddenly throw a roomful of strangers together. We reconvene and Sarah introduces the morning session, a focus on activities that early career scientists should do alongside their PhD to show that they have skills beyond basic research, giving them an edge when they face the job market. The butterflies begin to churn in my stomach ( feeding perhaps on the sauerkraut I had for breakfast) as the time for my talk looms. Although I am slowly becoming more comfortable (or at least less terrified!) of public speaking as the years go by, I always fear that I will stumble over my words, keep saying 'erm' or splutter to a halt. Perhaps the 'network bingo game' has helped me to feel more familiar with the audience because I manage to face down my trepidation and launch into my slides. Using examples of some of the activities I do at Sheffield, I outline various ideas of things they could get involved in - science-policy groups, volunteering, departmental committees.... I must have talked too fast though: although the talk was meant to last twenty minutes it felt more like five before I was sitting down again! But the talk seemed to be well received with some delegates kindly telling me afterwards that it had given them some things to think about. After sampling more traditional Czech delights over lunch ( fortunately I am a big fan of smoked mackerel and beetroot), it was time for the afternoon sessions. Whilst Sarah delivered her masterclass on writing cvs, I joined Mary Williams for an insight into the academic world of publishing. Mary produces resources for Teaching Tools in Plant Biology, a wonderful organisation which aims to improve the quality of plant science teaching resources for Unviersity students, and so hopefully convince more of them that plants are just as worthy a career choice as animals! Fist of all, Bennet Young, an assistant editor at the Journal of Experimental Biology, described the process by which papers are considered for publication in scientific journals. It was surprising to learn what a convoluted process it is, even for papers which are ultimately rejected. Mary then led a discussion on the 'black box' of the peer review system, introducing us to some of the new systems that have recently been piloted. I'm not sure I like the idea of 'open review' where ANYONE can leave an anonymous comment against your research...to me it seems likely to lead to the type of aggressive, bickering behaviour seen sometimes on Twitter and Facebook- after all, scientists are very passionate about their work! We have a short break before the evenings activities - I decide to relocate to a nearby cafe to plan my next few days over a calming ginger tea. I return in time to join the 'Science with Impact' session, with the theme this year of 'Rising CO2 - it's not just about Global Warming'. It was sobering to be reminded how unlikely it is that the human race will curb carbon dioxide emissions enough to keep the temperature from rising above the critical two degree threshold. Which makes it more important than ever that researchers investigate the probable effects on the environment and ecosystems. 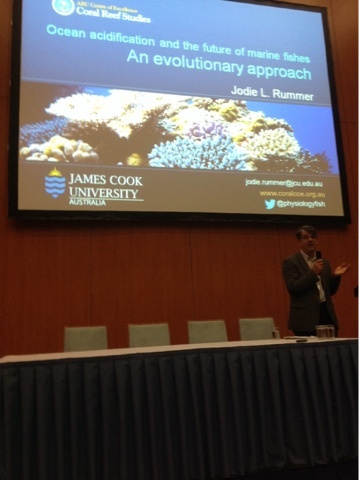 Jodie Rummer, who studies coral reef systems at James Cook University, Australia, described some of the surprising ways in which ocean acidification (caused by increased levels of dissolved carbon dioxide) can affect reef fish, interfering with their cognitive processes to the extent that they appear to be 'dumb fish'. Following this, Hans-O.Pörtner, of the Alfred-Wegener-Institute, Germany, described the process by which the IPCC ( Intergovernmental Panel on Climate Change) reports are compiled. I had no idea it took as long as five years for each report - it makes the literature reviews I have had to do for my course seem rudimentary! Alison Smith, from the University of Cambridge, then gave a review of the feasibility of using algae to make the biofuels of the future. Whilst algae are attractive in that they can be cultivated with low- technology methods ( even just a plastic bag filled with water! ), and they can also produce other high quality products (such as vitamins) at the same time, scaling the process up is a huge problem. It would take 17 million hectares of cultivated algae to meet the UK's fuel needs... And the UK is only 24 million hectares in size! Finally, Bill Davies offered a story of hope to counter the 'perfect storm' brewing for the future, where food, energy and water will likely be in short supply. Using low- technology methods and working with farmers, an international collaboration of researchers working in Northwest China were able to restore an ancient oasis that had been ravaged to a desert state by unsustainable farming. Now, lakes that had been dry for sixty years are beginning to flow with water again. These methods include 'alternating irrigation', where the plant roots are only watered intermittently and allowed to dry in between. It is not known HOW exactly this works, but it is thought to manipulate the plant's intrinsic hormone signalling systems, making it more sensitive to drought. This causes the plant to close the stomata ( tiny pores on the underside of the leaf that allow gas exchange) and conserve water. It felt like a real call to arms - as Alison Grey said 'The future of science is in this room'. If there could ever be a worthy way for scientific research to have an 'impact' , then promoting the world to take action against climate change would be a good place to start. Visions of a future indeed...but for now, the immediate matter to hand is the pre-meeting networking event. I have interviews to arrange so dodge about between the crowds sampling the gherkins and cheese counter. 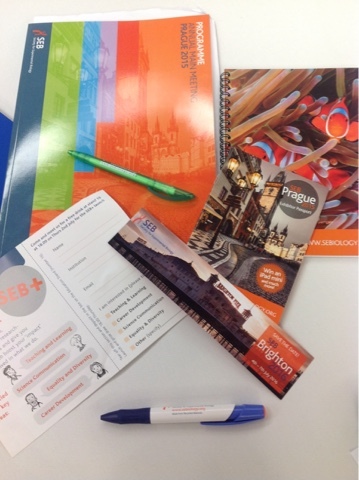 It's been a busy first day - but what could I expect from the SEB?